Solarfast Red Mulch Paint is a colorant used to restore faded mulch back to its original color. It is environmentally friendly and does not contain hazardous chemicals, heavy metals or other ingredients that are known to be harmful to the environment. 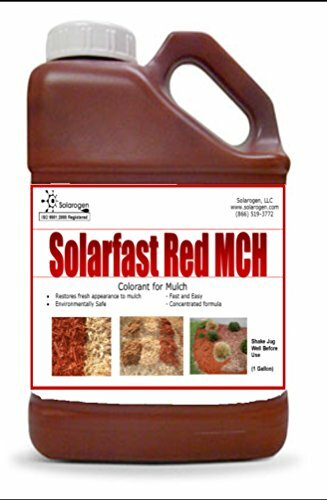 Using Solarfast Red Mulch Paint the quick, easy, and economical for improving your landscape's overall appearance. High Quality-Each Batch of our product has been rigorously tested in order to ensure a consistent and high-quality color. Will Not Fade-Once the color is applied properly and allowed to dry, it will not fade for a minimum of one year. Economical-A little bit goes a long way. Dilute with water at a ratio of 1:10 for a solution that can cover up to 5,000 square ft! Environmentally Friendly- Our product is made from environmentally friendly components so you can color with a clear conscious. View More In Lawn & Mulch Paint. If you have any questions about this product by Solarfast, contact us by completing and submitting the form below. If you are looking for a specif part number, please include it with your message. Lawnlift Ultra Concentrated (Mocha) Mulch Paint 8oz. = 2.5 Quarts of Product.